In 1921, President Warren G. Harding, R, at the behest of the oil barons who financed his election, appointed Albert Bacon Fall to be his secretary of the Interior. Fall had vowed not only to transfer all public lands to private interests, but also to abolish the Interior Department altogether. As a Cabinet member, he set out to dismantle the conservation ethos that Republican President Theodore Roosevelt had brought to Washington and to open federal fossil fuels and other resources to unfettered development, effectively handing the keys to Interior to his oil buddies. “All natural resources should be made as easy of access as possible to the present generation,” he once said. Albert B. Fall was the Secretary of Interior under President Warren G. Harding. Ryan Zinke, the current Interior secretary, likes to compare himself to Roosevelt. Yet he far more closely resembles Fall. Fall’s easy-access creed is reflected in Zinke’s systematic evisceration of environmental protections, a crusade clearly laid out in the Interior Department’s recently leaked four-year strategic plan, and in its “review” of department actions that allegedly “burden domestic energy.” The former, from which all mentions of the “climate” have been stricken, provides a blueprint for private exploitation of public lands, while the latter provides an extensive list of the energy-specific rules now on the chopping block. Other hindrances to leasing land for energy production. In August, the BLM announced that — “in accordance with the President’s policy of Making America Safe through Energy Independence” — it would lease 26 parcels covering nearly 4,800 acres of federal land within the Navajo Nation in the Chaco region in New Mexico. That defies calls from the Navajo Nation’s president, archaeologists, local residents and the All Pueblo Council of Governors to hold off on new leasing and drilling until a new environmental analysis is complete. “For too long America has been held back by burdensome regulations on our energy industry,” Zinke said in the secretarial order, which ostensibly will help the fossil fuel industry achieve “American energy dominance.” As is often the case with this administration, a yawning abyss exists between the rhetoric and reality. 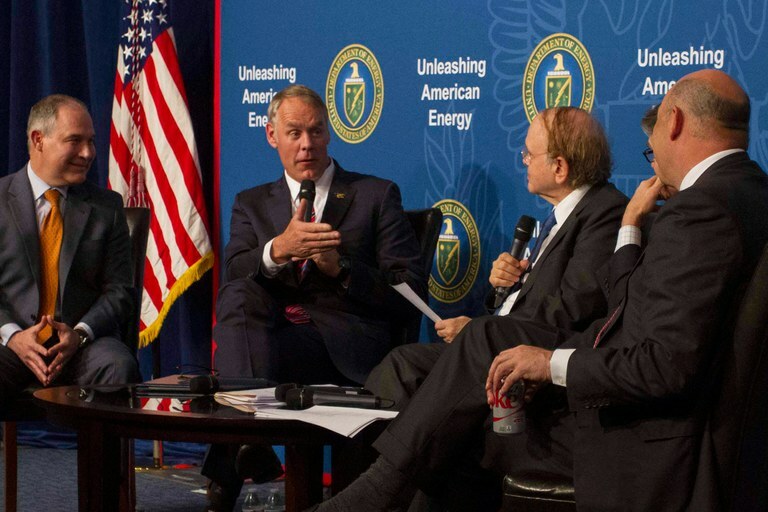 Interior Secretary Ryan Zinke speaks with Secretary of Energy Rick Perry, Environmental Protection Agency Administrator Scott Pruitt and Director of National Economic Council Gary Cohn at a June roundtable discussion on energy dominance. The United States achieved energy dominance under the Obama administration, when a drilling and mining frenzy — fueled by decades of federal tax credits and regulatory exemptions — made it the planet’s leading oil and gas producer, among the top five for natural gas, and one of the largest exporters of refined petroleum products. The U.S. continues to import millions of barrels of oil per day, not because production is stifled —more than 36,000 drilling permits were issued over the last eight years — but because Americans are reckless, carbon-spewing oil gluttons. If this is what being “held back” looks like, it’s chilling to imagine how an unfettered hunger for energy could play out under Zinke’s cynical watch. What Zinke has failed to realize is that every “burden” removed from industry ends up falling on the backs of the country’s land, air, water, wildlife — and people. Albert Fall — a product of the “Crazy Years” of the 1920s — never quite figured that out, either. Like Zinke, Fall didn’t hesitate to accept gifts from oil tycoons in exchange for regulatory handouts. Back then, however, this was called bribery, and Fall ultimately went to jail for his role in the Teapot Dome Scandal. His legacy is equally tarnished by his efforts to yank oil, land and water away from tribal nations. 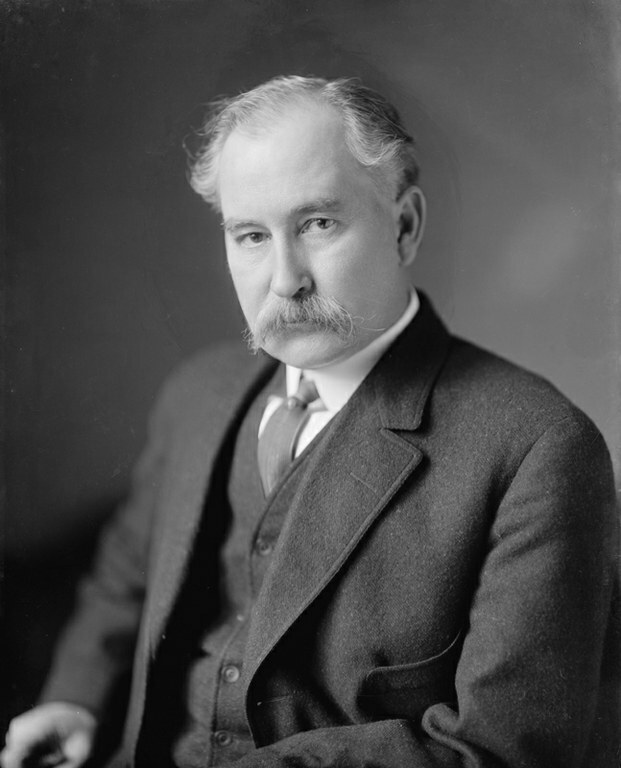 Harding, meanwhile, died before his first term was up and is widely considered the worst president in history. At least so far.